A project is an independent entity that contains all the data on your application content organized in a set of directories. The .project file containing metadata is associated with the project. One project can consist of several worlds. So, there is no need to create a separate project for each world. Open the Projects tab in the SDK browser. Click Create New. The new project creation window will be opened. Define the name of the project, choose a path to store project files, specify the SDK and UNIGINE Engine build to be used. The Release build allows checking the final performance of the application. 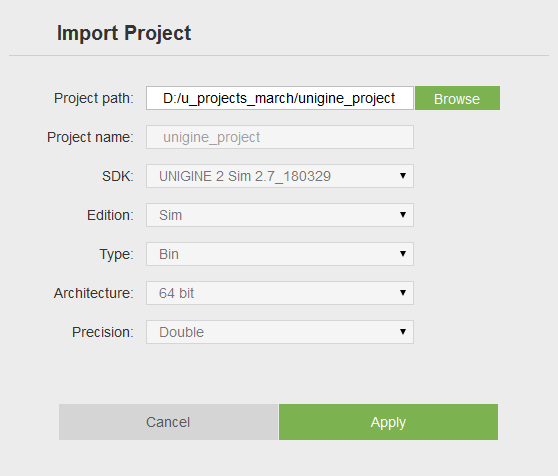 The project will be created in the <project path>/<unigine_project> folder. Specify the required application and general settings. Specify the add-ons to be added (optional). Click Create New Project. The project will appear in the projects list. 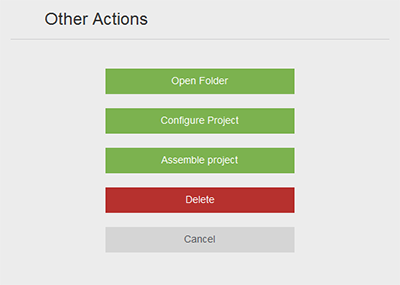 You can change the project settings any time by clicking Other Actions -> Configure Project. UnigineScript only - UnigineScript will be used to implement the project. C++ (Qt-based) - Qt Creator, QMake or CMake is required for building the project. App* plugins (AppProjection, AppSurround, AppWall, AppPanorama, and others) cannot be used in a Qt-based application. C# - C# API will be used to implement the project. The Visual Studio will be used to compile a project. 32 bit - create the 32-bit release version of the application (_x86 postfix of the binary executable). 64 bit - create the 64-bit release version of the application (_x64 postfix of the binary executable). 32 and 64 bits - create the both 32-bit and 64-bit release versions of the application. The libraries and binaries of the corresponding version will be copied to the bin directory of the project folder. Create a project with the launcher. Render the application across 3 monitors using the NVIDIA 3D Vision technology and multiple GPUs. The App3DSurround plugin is available on DirectX 11 only. Render the application onto 1 monitor using NVIDIA 3D Vision technology. The App3DVision plugin is available on DirectX 11 only. 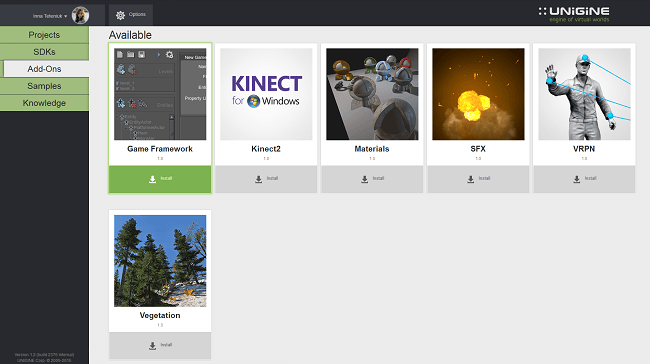 Create project with the Oculus Rift virtual display support. Create project with the HTC Vive output support. Output 2 separate images for each eye. The AppSeparate supports DirectX 11 only. Render the application across 3 monitors simultaneously. Render the application into the configurable number of monitors. Create a project with the AppProjection plugin. All necessary files are copied and the launcher with the corresponding settings is generated. Create a project with the AppEasyBlend plugin. 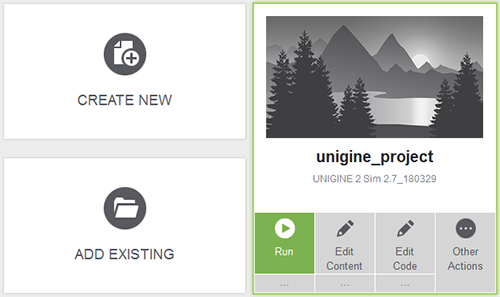 Create a project with the Syncker plugin for multi-channel rendering synchronization. Create a project with the CIGI Client plugin. Create a project with the SSLSocket plugin. Create a project with the plugin for Steam integration. GPU frequencies and temperature monitoring. Create a project with the Interface plugin. The project can be created including any add-on available in the Add-Ons tab. 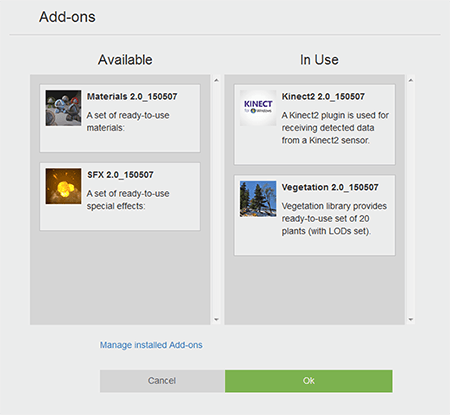 All of the required add-ons can be added both on and after project's creation. Download the required add-on in the Add-Ons tab by clicking Install. Any amount of add-ons could be added to a project afterwards. On project creation, specify the add-ons to be included by clicking the Add-ons (0) button. Drop the required add-ons from the Available field to In Use. You can add any amount of add-ons to the project. After all add-ons are dropped, click Ok. If you haven't downloaded the add-on, click Manage installed add-ons. You will be redirected to the page with available add-ons. Click Create New Project. To enable added add-ons in the project, you should follow instructions on each add-on. 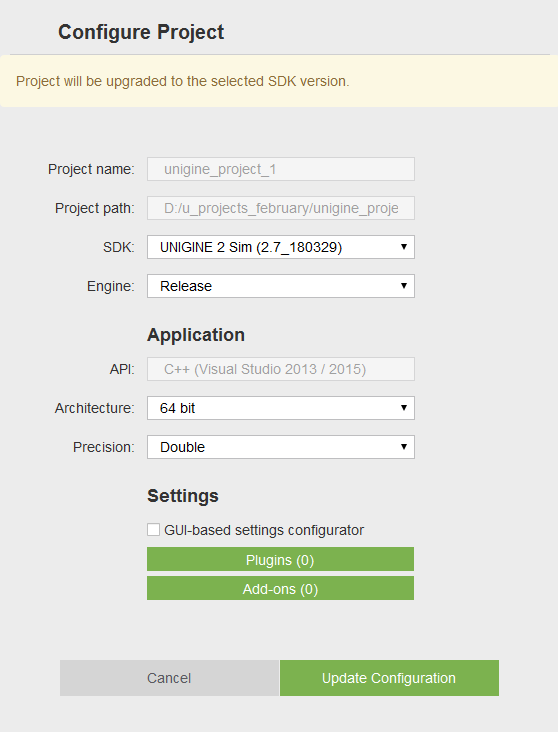 Click Other Actions -> Configure Project. Click the Add-ons (0) button and drag and drop the required add-ons from the Available field to In Use. Click Ok and then click Update Configuration. Click Add Existing in the Projects tab. In the file dialog window that opens, specify the path to the project folder and click Import Project. The project will appear in the projects list. The name of the project. 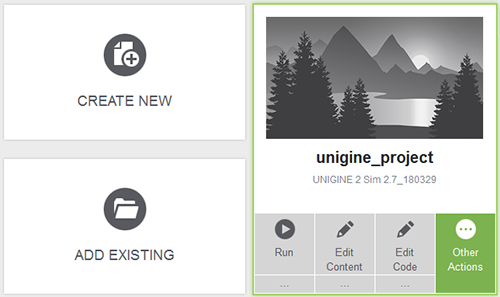 The version of UNIGINE SDK used to create the project. The edition of UNIGINE SDK used to create the project. 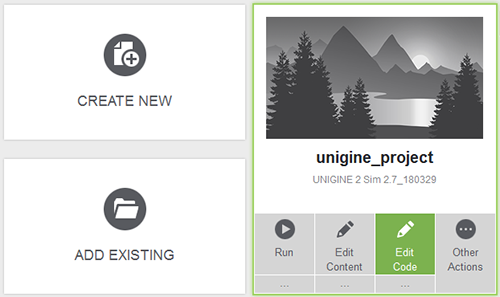 The type of UNIGINE SDK used to create the project. The version of the release version of an application (32 or/and 64 bit). he coordinates precision used to create the project. This information is required to create the .project file containing metadata associated with the project. 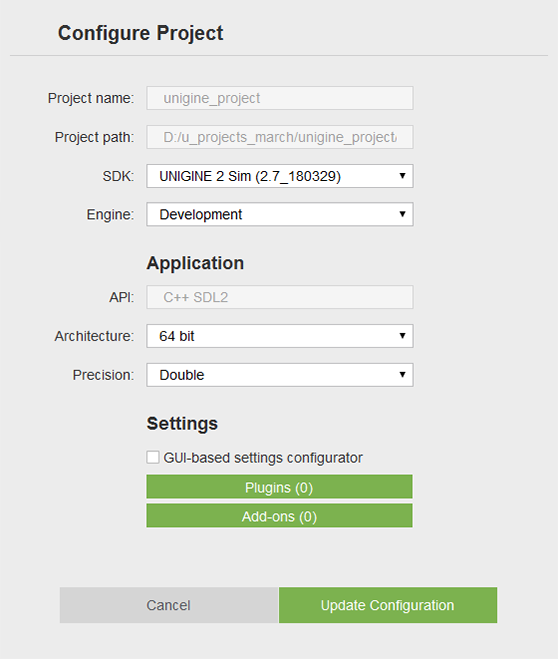 If the added project was created in the SDK of a previous version, it will be marked with the Upgrade available label. Choose the newest installed version of the SDK and click Update Configuration. Specify a path to the backup folder into which the original project will be copied. 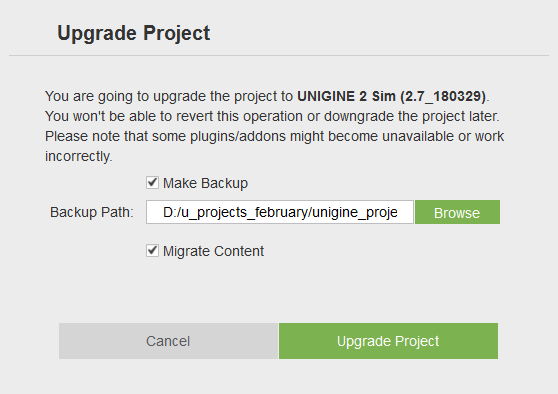 Leave Migrate Content checked and click Upgrade Project. The project will be upgraded automatically. You can also manually upgrade the project by running the upgrade script. In both cases, the same script will be used. The source code should be upgraded manually by using the Migration Guide. 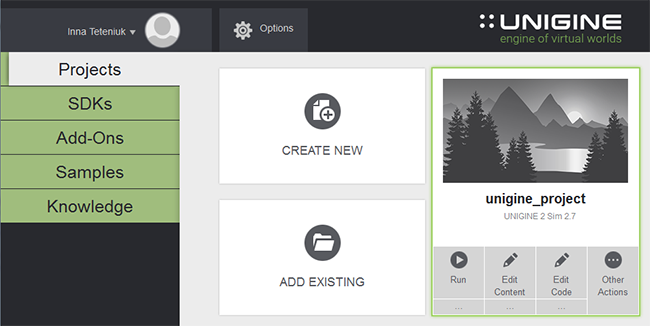 Run the project with the loaded editor by clicking Edit Content. Clicking Edit Content will only launch the Editor, you will have to load the world manually: via the console, via the File -> Open World in the Menu Bar of the UnigineEditor or by double-clicking the *.world file in the Asset Browser. launch_debug - the launcher of the project's debug version. 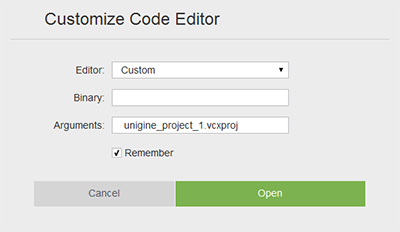 launch_editor - the launcher of the project's with the loaded editor. launch_release - the launcher of the project's release version. launcher - the startup file for the launcher that provides a GUI to configure application options and run the application. This launcher can be customized and used in the release version of your project. To create a project with the launcher, check the GUI-based settings configurator box in the project's creation window. 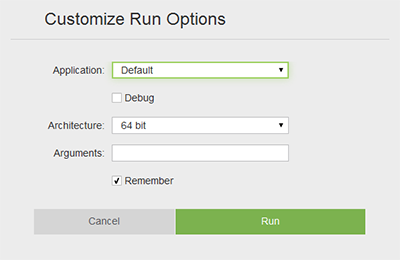 In the Customize Run Options form that opens, set the required values and click Run. 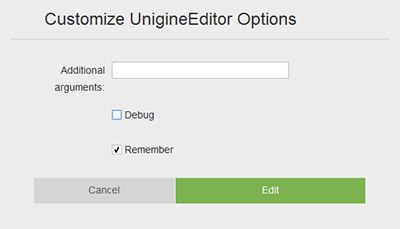 In the Customize UnigineEditor Options form that opens, set the required values and click Edit. Clicking Edit Content will only launch the Editor, you will have to load the world manually via the console or via the File -> Open World in the main menu of the UnigineEditor. Via this form the project without the loaded editor can be run with the custom settings. Indicates whether debug or release version of the application should be run. 32-bit - the 32-bit version of the main application. 64-bit - the 64-bit version of the main application. Indicates whether to remember the specified custom settings for future run or not. Name of the custom main application. Here the name of the compiled binary executable located in the bin folder of the project should be specified. If the binary executable is located outside this folder, a path to it relative to the bin folder should be specified. The editor version (debug or release) that will be used for project's editing. 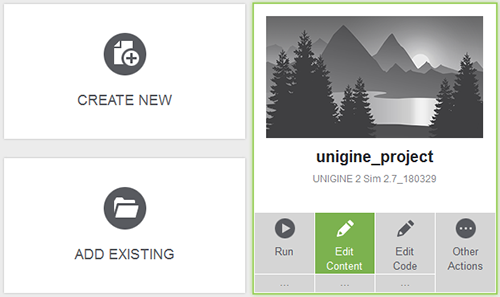 See the articles in the Programming Overview section to learn how to edit the opened project. Specify the required settings (see below) and click Assemble. The data/.runtimes folder with all its contents. The guids.db file stored in the data folder. The source assets from the data folder with the valid *.meta files that have no generated runtime files. The *.meta files of such assets aren't included in the final build. The *.umount files (mount points) that refer to the external directories. Keep files in the external directories unchanged to avoid issues in the assembled project. If you exclude the *.umount files, the referenced content won't be available in the final build, and the project will be invalid. The source/, bin/ folders, the *.project and *.cache files, launchers are excluded from the final build by default. The bin folder from the project folder is excluded. In the final build, there will be the bin folder storing the release version of the binary executable and the libraries. The release build destination folder. You shouldn't create this folder inside your project folder, as it may significantly increase its size. Files and folders that should be excluded from the release build. Use the wildcards patterns to exclude the required items. By default, the following files and folders are excluded: *.project, *.cache, *.bat, *.sh files, bin/, source/ folders. Files and folders stored in the data folder won't be excluded. The release build architecture type. The path to the custom configuration file for the release build (optional). Types of files that should be compressed to reduce hard drive memory usage. This won't influence the engine performance much. Use the wildcards patterns to include/exclude the required items. The maximum size of the archive is 2 GB. By default, files of the following types are compressed: *.h, *.cpp, *.ui, *.world, *.node, *.mat, *.meta. Data streaming doesn't work for UNG/ZIP contents. This option is available on Linux only. Delete all debug information from the build binaries. This will reduce the binaries size without any performance cost. Specify settings to be used for assembling the project. 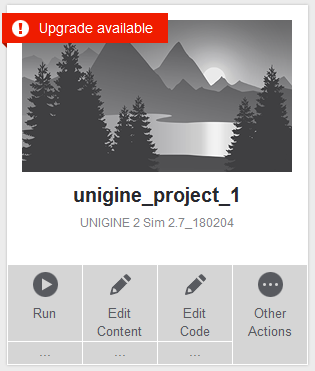 Via this form you can change settings of an existing project: the UNIGINE Engine build used for the project, the version of the release application, the coordinates precision and the general settings. Also this option should be used when you need to upgrade the existing project to the newest version of the SDK. If some of the files listed above are changed, the .modified postfix will be added to names of such files. At that, the files from the SDK will also be copied.